The Golding Official Imprinter is based on a No. 12 “Map” press with the addition of a flywheel. Very few presses of this design were manufactured. 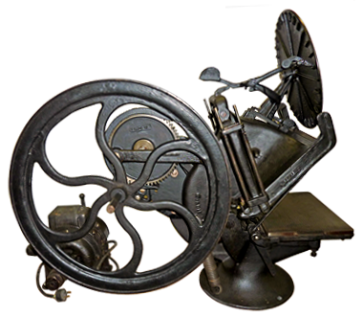 The press shown was used to print clothing labels and other cloth items such as canvas bags. Power was supplied from a direct drive variable speed motor. It is one of the largest tabletop presses made weighing over 250 lbs.